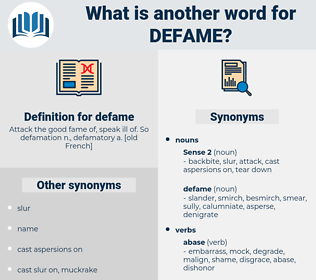 What is another word for defame? flatter, laud, commend, honor, praise, compliment, approve, exalt. absolve, champion, exculpate, shield, esteem, clear, benefit, acclaim, pardon, favor, Panegyrize, conserve, eulogize, worship, remit, exonerate, vindicate, forgive, defend, regard, extol, care for, glorify, cherish, tend, shrive, respect, uphold, consider, sustain, advocate, applaud, admire, excuse, acquit, protect, justify. On the contrary, it is probably safe to say, speaking generally, that the French romancers systematically defame their compatriots, and that even Parisian society is not the institution it is represented to be in novels, on the stage, and by many of the essayists.
" I reckon there ain't nothing square about him," returned Duncan, glad of an opportunity to defame his enemy. 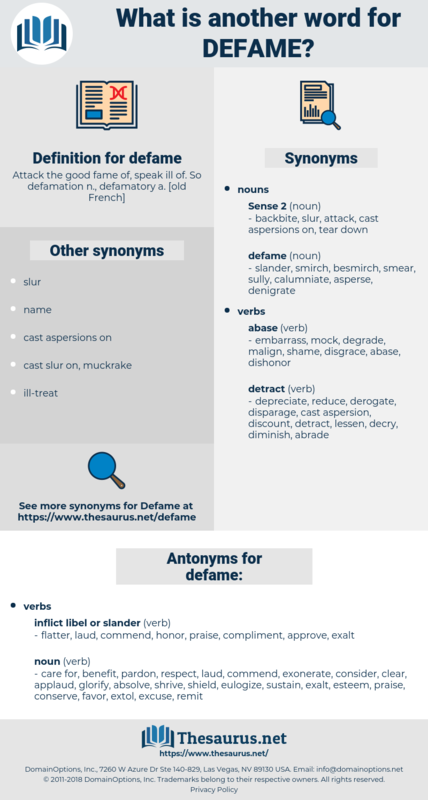 deadpan, devein, dipnoi, depone, deafen, dopamine, devonian, dauphin, debone, dubbin, divine, daphne, devon, define, dobbin, deepen, dubnium, daphnia, divan, diaphone.